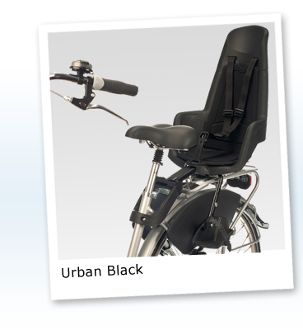 The Bobike Maxi+ stands for uncompromising safety. Children aged from 9 months to around 6 years (or 22 kg, 48 lb) enjoy maximum comfort and optimal protection in this attractively designed children’s bicycle seat. The three-point belt, the well thought out protective edges to the footrests, and the adjustable foot straps guarantee a feeling of safety for children and parents. The Bobike Maxi+ also fits on virtually every bicycle with or without a baggage carrier including mountain bikes. The seat padding can be easily removed for cleaning. The Bobike Maxi+ is of course approved according to the stringent European safety standard EN 14344.